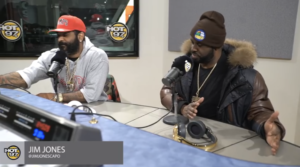 02.09.17 | No Comments | Tom G.
Jim Jones sits with Funk Flex to catch up on #WeGotaStoryToTell004. He spoke about growing up in Harlem, the rise and fall of The Diplomats, Cam’ron and Roc-A-Fella, and much more. He gave a detailed and passionate look into everything Diplomats. He spoke about Juelz Santana, Freekey Zekey, Mase, Six Figga Digga, J.R. Writer, and Cam’s cousin Bloodshed as well. In the early days it was Children of the Corn and BBO. Jim Jones said when him and Cam were young they would record VHS from Music video channels of Twista, Jay-Z, and Nas. When Cam got kicked out of college he moved in with Jim Jones and his apartment in Harlem became The Diplomats home base. In the late 90’s Mase was signed to Puff and Cam’ron was signed to Sony. Later on Dame Dash started to manage Cam and he got signed to Roc-A-Fella. Jim Jones also spoke about what it was like for him to get a deal while being a member of the group. He told a story about being in the studio with Cam’ron, Jay-Z, and Just Blaze for their first collaboration, “Welcome To New York City” and the friendly competition that ensued between them. He also touched on signing Max B and the success that came with “Ballin'”. What sticks out the most throughout the interview is Jim Jones’ loyalty to Cam’ron and the Diplomats. His dedication and passion for the group was clearly a major component in its success.